This is a new minor version release, bringing bug fixes, the BIP65 (CLTV) consensus change, and relay policy preparation for BIP113. It is recommended to upgrade to this version as soon as possible. If you are running an older version, shut it down. Wait until it has completely shut down (which might take a few minutes for older versions), then run the installer (on Windows) or just copy over /Applications/Bitcoin-Qt (on Mac) or bitcoind/bitcoin-qt (on Linux). Blocks will be stored on disk out of order (in the order they are received, really), which makes it incompatible with some tools or other programs. Reindexing using earlier versions will also not work anymore as a result of this. The block index database will now hold headers for which no block is stored on disk, which earlier versions won’t support. If you want to be able to downgrade smoothly, make a backup of your entire data directory. Without this your node will need start syncing (or importing from bootstrap.dat) anew afterwards. It is possible that the data from a completely synchronised 0.10 node may be usable in older versions as-is, but this is not supported and may break as soon as the older version attempts to reindex. This does not affect wallet forward or backward compatibility. There are no known problems when downgrading from 0.11.x to 0.10.x. This release includes several changes related to the BIP65 soft fork which redefines the existing OP_NOP2 opcode as OP_CHECKLOCKTIMEVERIFY (CLTV) so that a transaction output can be made unspendable until a specified point in the future. This release will only relay and mine transactions spending a CLTV output if they comply with the BIP65 rules as provided in code. This release will produce version 4 blocks by default. Please see the notice to miners below. Once 951 out of a sequence of 1,001 blocks on the local node’s best block chain contain version 4 (or higher) blocks, this release will no longer accept new version 3 blocks and it will only accept version 4 blocks if they comply with the BIP65 rules for CLTV. 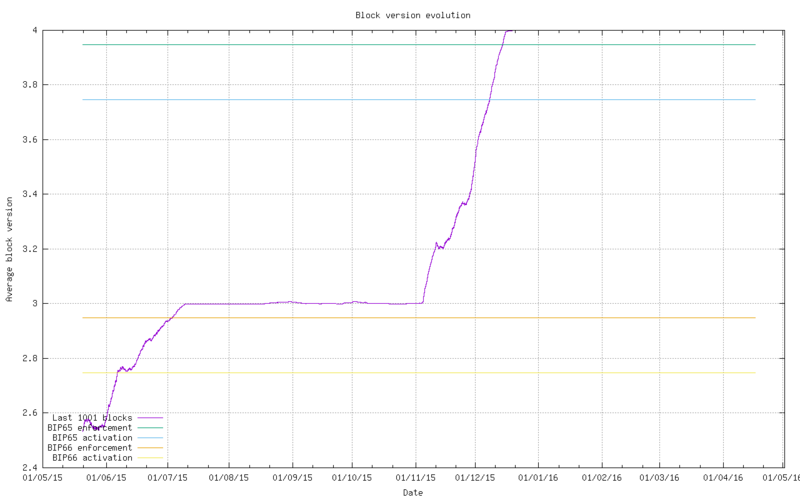 Notice to miners: Bitcoin Core’s block templates are now for version 4 blocks only, and any mining software relying on its getblocktemplate must be updated in parallel to use libblkmaker either version 0.4.3 or any version from 0.5.2 onward. If you are solo mining, this will affect you the moment you upgrade Bitcoin Core, which must be done prior to BIP65 achieving its 951/1001 status. If you are mining with the stratum mining protocol: this does not affect you. If you are mining with the getblocktemplate protocol to a pool: this will affect you at the pool operator’s discretion, which must be no later than BIP65 achieving its 951/1001 status. Bitcoin transactions currently may specify a locktime indicating when they may be added to a valid block. Current consensus rules require that blocks have a block header time greater than the locktime specified in any transaction in that block. Miners get to choose what time they use for their header time, with the consensus rule being that no node will accept a block whose time is more than two hours in the future. This creates a incentive for miners to set their header times to future values in order to include locktimed transactions which weren’t supposed to be included for up to two more hours. The consensus rules also specify that valid blocks may have a header time greater than that of the median of the 11 previous blocks. This GetMedianTimePast() time has a key feature we generally associate with time: it can’t go backwards. BIP113 specifies a soft fork (not enforced in this release) that weakens this perverse incentive for individual miners to use a future time by requiring that valid blocks have a computed GetMedianTimePast() greater than the locktime specified in any transaction in that block. Mempool inclusion rules currently require transactions to be valid for immediate inclusion in a block in order to be accepted into the mempool. This release begins applying the BIP113 rule to received transactions, so transaction whose time is greater than the GetMedianTimePast() will no longer be accepted into the mempool. Implication for miners: you will begin rejecting transactions that would not be valid under BIP113, which will prevent you from producing invalid blocks if/when BIP113 is enforced on the network. Any transactions which are valid under the current rules but not yet valid under the BIP113 rules will either be mined by other miners or delayed until they are valid under BIP113. 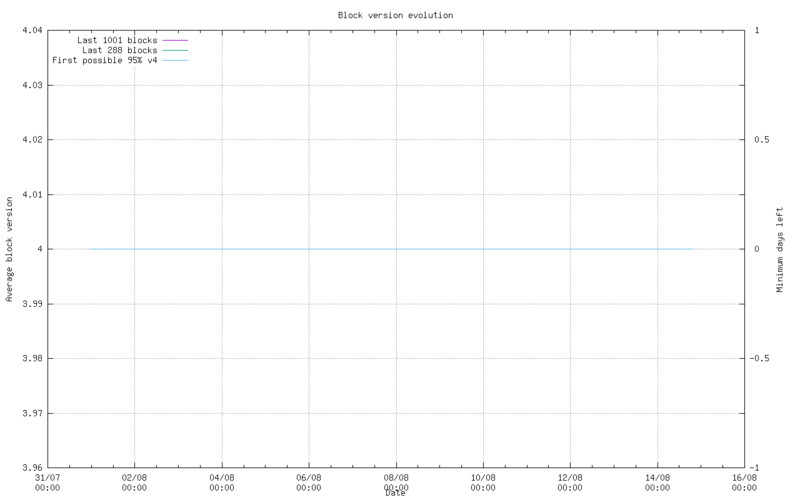 Note, however, that time-based locktime transactions are more or less unseen on the network currently. Implication for users: GetMedianTimePast() always trails behind the current time, so a transaction locktime set to the present time will be rejected by nodes running this release until the median time moves forward. To compensate, subtract one hour (3,600 seconds) from your locktimes to allow those transactions to be included in mempools at approximately the expected time. Several Windows users reported that they often need to reindex the entire blockchain after an unclean shutdown of Bitcoin Core on Windows (or an unclean shutdown of Windows itself). Although unclean shutdowns remain unsafe, this release no longer relies on memory-mapped files for the UTXO database, which significantly reduced the frequency of unclean shutdowns leading to required reindexes during testing. Other fixes for database corruption on Windows are expected in the next major release. #6867 95a5039 Set TCP_NODELAY on P2P sockets. #6856 dfe55bd Do not allow blockfile pruning during reindex. And those who contributed additional code review and/or security research.